The Constitution currently in effect was enacted in 1987, during the administration of President Corazon Aquino, and is popularly known as the "1987 Constitution". Philippine constitutional law experts recognize three other previous constitutions as having effectively governed the country — the 1935 Commonwealth Constitution, the 1973 Constitution, and the 1986 Freedom Constitution. 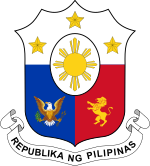 Constitutions for the Philippines were also drafted and adopted during the short-lived governments of Presidents Emilio Aguinaldo (1898) and Jose P. Laurel (1943). — Excerpted from Constitution of the Philippines on Wikipedia, the free encyclopedia. We, the sovereign Filipino people, imploring the aid of Almighty God, in order to build a just and humane society and establish a Government that shall embody our ideals and aspirations, promote the common good, conserve and develop our patrimony, and secure to ourselves and our posterity the blessings of independence and democracy under the rule of law and a regime of truth, justice, freedom, love, equality, and peace, do ordain and promulgate this Constitution. Section 5.. The maintenance of peace and order, the protection of life, liberty, and property, and promotion of the general welfare are essential for the enjoyment by all the people of the blessings of democracy. (1) Any person under investigation for the commission of an offense shall have the right to be informed of his right to remain silent and to have competent and independent counsel preferably of his own choice. If the person cannot afford the services of counsel, he must be provided with one. These rights cannot be waived except in writing and in the presence of counsel. (1) No person shall be held to answer for a criminal offense without due process of law. (1) No person shall be detained solely by reason of his political beliefs and aspirations. (1) Excessive fines shall not be imposed, nor cruel, degrading or inhuman punishment inflicted. Neither shall death penalty be imposed, unless, for compelling reasons involving heinous crimes, the Congress hereafter provides for it. Any death penalty already imposed shall be reduced to reclusion perpetua. (1) The House of Representatives shall be composed of not more than two hundred and fifty members, unless otherwise fixed by law, who shall be elected from legislative districts apportioned among the provinces, cities, and the Metropolitan Manila area in accordance with the number of their respective inhabitants, and on the basis of a uniform and progressive ratio, and those who, as provided by law, shall be elected through a party-list system of registered national, regional, and sectoral parties or organizations. (1) The Senate shall elect its President and the House of Representatives, its Speaker, by a majority vote of all its respective Members. Each House shall choose such other officers as it may deem necessary. (1) The Congress, by a vote of two-thirds of both Houses in joint session assembled, voting separately, shall have the sole power to declare the existence of a state of war. (1) The Congress may not increase the appropriations recommended by the President for the operation of the Government as specified in the budget. The form, content, and manner of preparation of the budget shall be prescribed by law. (1) Every bill passed by the Congress shall embrace only one subject which shall be expressed in the title thereof. (1) Every bill passed by the Congress shall, before it becomes a law, be presented to the President. If he approves the same he shall sign it; otherwise, he shall veto it and return the same with his objections to the House where it originated, which shall enter the objections at large in its Journal and proceed to reconsider it. If, after such reconsideration, two-thirds of all the Members of such House shall agree to pass the bill, it shall be sent, together with the objections, to the other House by which it shall likewise be reconsidered, and if approved by two-thirds of all the Members of that House, it shall become a law. In all such cases, the votes of each House shall be determined by yeas or nays, and the names of the Members voting for or against shall be entered in its Journal. The President shall communicate his veto of any bill to the House where it originated within thirty days after the date of receipt thereof, otherwise, it shall become a law as if he had signed it. (1) The rule of taxation shall be uniform and equitable. The Congress shall evolve a progressive system of taxation. (1) No money shall be paid out of the Treasury except in pursuance of an appropriation made by law. "I do solemnly swear [or affirm] that I will faithfully and conscientiously fulfill my duties as President [or Vice-President or Acting President] of the Philippines, preserve and defend its Constitution, execute its laws, do justice to every man, and consecrate myself to the service of the Nation. So help me God." [In case of affirmation, last sentence will be omitted]. Section 10. The Congress shall, at ten o'clock in the morning of the third day after the vacancy in the offices of the President and Vice-President occurs, convene in accordance with its rules without need of a call and within seven days, enact a law calling for a special election to elect a President and a Vice-President to be held not earlier than forty-five days nor later than sixty days from the time of such call. The bill calling such special election shall be deemed certified under paragraph 2, Section 26, Article VI of this Constitution and shall become law upon its approval on third reading by the Congress. Appropriations for the special election shall be charged against any current appropriations and shall be exempt from the requirements of paragraph 4, Section 25, Article VI of this Constitution. The convening of the Congress cannot be suspended nor the special election postponed. No special election shall be called if the vacancy occurs within eighteen months before the date of the next presidential election. (1) The Supreme Court shall be composed of a Chief Justice and fourteen Associate Justices. It may sit en banc or in its discretion, in division of three, five, or seven Members. Any vacancy shall be filled within ninety days from the occurrence thereof. (1) No person shall be appointed Member of the Supreme Court or any lower collegiate court unless he is a natural-born citizen of the Philippines. A Member of the Supreme Court must be at least forty years of age, and must have been for fifteen years or more, a judge of a lower court or engaged in the practice of law in the Philippines. (1) A Judicial and Bar Council is hereby created under the supervision of the Supreme Court composed of the Chief Justice as ex officio Chairman, the Secretary of Justice, and a representative of the Congress as ex officio Members, a representative of the Integrated Bar, a professor of law, a retired Member of the Supreme Court, and a representative of the private sector. (1) All cases or matters filed after the effectivity of this Constitution must be decided or resolved within twenty-four months from date of submission for the Supreme Court, and, unless reduced by the Supreme Court, twelve months for all lower collegiate courts, and three months for all other lower courts. (1) The civil service shall be administered by the Civil Service Commission composed of a Chairman and two Commissioners who shall be natural-born citizens of the Philippines and, at the time of their appointment, at least thirty-five years of age, with proven capacity for public administration, and must not have been candidates for any elective position in the elections immediately preceding their appointment. (1) The civil service embraces all branches, subdivisions, instrumentalities, and agencies of the Government, including government-owned or controlled corporations with original charters. (1) There shall be a Commission on Elections composed of a Chairman and six Commissioners who shall be natural-born citizens of the Philippines and, at the time of their appointment, at least thirty-five years of age, holders of a college degree, and must not have been candidates for any elective positions in the immediately preceding elections. However, a majority thereof, including the Chairman, shall be members of the Philippine Bar who have been engaged in the practice of law for at least ten years. (1) There shall be a Commission on Audit composed of a Chairman and two Commissioners, who shall be natural-born citizens of the Philippines and, at the time of their appointment, at least thirty-five years of age, Certified Public Accountants with not less than ten years of auditing experience, or members of the Philippine Bar who have been engaged in the practice of law for at least ten years, and must not have been candidates for any elective position in the elections immediately preceding their appointment. At no time shall all Members of the Commission belong to the same profession. (d) such non-governmental entities receiving subsidy or equity, directly or indirectly, from or through the Government, which are required by law or the granting institution to submit to such audit as a condition of subsidy or equity. However, where the internal control system of the audited agencies is inadequate, the Commission may adopt such measures, including temporary or special pre-audit, as are necessary and appropriate to correct the deficiencies. It shall keep the general accounts of the Government and, for such period as may be provided by law, preserve the vouchers and other supporting papers pertaining thereto. During their tenure, they shall be subject to the same disqualifications and prohibitions as provided for in Section 2 of Article IX-A of this Constitution. Section 1. The goals of the national economy are a more equitable distribution of opportunities, income, and wealth; a sustained increase in the amount of goods and services produced by the nation for the benefit of the people; and an expanding productivity as the key to raising the quality of life for all, especially the under-privileged. The State shall promote industrialization and full employment based on sound agricultural development and agrarian reform, through industries that make full and efficient use of human and natural resources, and which are competitive in both domestic and foreign markets. However, the State shall protect Filipino enterprises against unfair foreign competition and trade practices. (1) All educational institutions shall include the study of the Constitution as part of the curricula. (1) The State recognizes the complementary roles of public and private institutions in the educational system and shall exercise reasonable supervision and regulation of all educational institutions. (1) the State shall take into account regional and sectoral needs and conditions and shall encourage local planning in the development of educational policies and programs. (1) The State shall ensure equal access to cultural opportunities through the educational system, public or private cultural entities, scholarships, grants and other incentives, and community cultural centers, and other public venues. (1) The State shall promote physical education and encourage sports programs, league competitions, and amateur sports, including training for international competitions, to foster self-discipline, teamwork, and excellence for the development of a healthy and alert citizenry. (1) All members of the armed forces shall take an oath or affirmation to uphold and defend this Constitution. (1) The ownership and management of mass media shall be limited to citizens of the Philippines, or to corporations, cooperatives or associations, wholly-owned and managed by such citizens. Section 7. Until a law is passed, the President may fill by appointment from a list of nominees by the respective sectors, the seats reserved for sectoral representation in paragraph (2), Section 5 of Article VI of this Constitution. Section 23. Advertising entities affected by paragraph (2), Section 11 of Article XVI of this Constitution shall have five years from its ratification to comply on a graduated and proportionate basis with the minimum Filipino ownership requirement therein. This page was last edited on 9 December 2018, at 14:33.